BBC NEWS | UK | Magazine | Now, is that magic? Jeremy Vine: "You'll like this, not a lot..."
There used to be something sacred about magic tricks, but in an era when secrets can be circulated around the world in seconds, where do magicians stand? 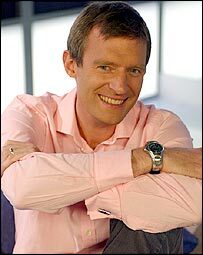 Jeremy Vine decided to find out, only to discover there's more to magic than theory alone. For a long time I reckoned I had already endured my worst ever moment in broadcasting, and could go no lower. The occasion the automatic door of a train toilet slid open without warning while I was seated inside happened during my time presenting Newsnight, and was one of the reasons for starting a new life on Radio 2. That loo incident marked an all-time low - at least until the day I met Alan Shaxon, president of the Magic Circle. No disrespect to Mr Shaxon, an urbane magician of the old school, whose brilliant ways with coins and cards were a wonder to behold. This new embarrassment was all mine. I'd decided to try to impress him with a trick of my own, during the making of a radio programme about his organisation. As Britain's "Mr Magic", Alan Shaxon presides over a famously secret organisation. For 100 years the Magic Circle has, through its members' combined knowledge, been the keeper of secrets behind all those infuriatingly puzzling tricks. The sawn-in-half woman... that bunny pulled out of the top hat... those rings that somehow link together... Magicians in the Magic Circle are forbidden from freely talking about how these stunts are performed. Those who have overstepped the line, such as the US magician John Lenahan, who is based in Britain, have been unceremoniously ejected. Lenahan's big mistake was to appear on prime time TV talking, in rather too much detail, about his art. The truth is it's much easier to be thrown out of the Magic Circle than it is to break in. However, judging by my performance in front of Mr Shaxon, I wasn't even close to being admitted, let alone expelled. My godson sparked my interest in magic. Some years ago the desire to prove to Daniel, now aged 10, that his godfather had at least one talent spurred me into learning card tricks. One of them involves two black aces on either side of a card that disappears. The missing card emerges between the two red aces in the centre of the pack. It's brilliant. Correction: it's brilliant when it works. The night before my meeting with Mr Shaxon, I hunted for the book with the details of the trick in - which swallowed up an hour of valuable rehearsal time. For the rest of the evening I practised the move. The pack has to be prepared and shuffled cleverly. I'll say no more; a secret is a secret. The moment came. Mr Shaxon arrived in a whirl of aces, Jacks and Queens. Cards spun around his hand like a flywheel. Distinctly intimidated, I nevertheless persisted. "If possible," I said seriously, "I would like to show you a trick first." "Fine by me," he replied, leaning forwards. Put aside all thoughts of that train to Hitchin and the automatic door. This was far, far worse. Genuinely intending to pull the trick off with aplomb, I managed to reveal the missing card the moment it disappeared and lose one of the red aces just when it was needed. I tried to blame a faulty deck but no one was falling for it. "I'm sorry about this," I stammered. "Don't worry, don't worry," he replied as my embarrassment grew. In an era when information can be copied and circulated across the internet in a matter of seconds, secrets have become much harder to keep. What was once private chatter between magicians in clubs and magic shops is now public chatter on hundreds of websites, open to anyone with an internet connection. This makes life very hard indeed for organisations like the Magic Circle. Ultimately, it could undermine the very nature of magic itself. But that is to think there is nothing more to magic than secrets, says Mr Shaxon. Magic is a skill, he says. Skills take time and effort to develop. After my bumbling confusion with the aces, I didn't need persuading. Now the most embarrassing moment of my career doesn't involve a faulty train door, but a pack of cards which slid open at the wrong moment. 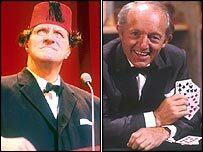 Trouble in the Magic Circle (first broadcast in October 2005) will be re-broadcast on BBC Radio 4 on Wednesday 7 July 2006 and can be heard at Radio 4's Listen again page for seven days after that.